Marcus Brookstone, Earl of Spenford, was certain his position and wealth more than compensated for the urgent, somewhat irregular nature of the request. Every father in England would be honored to hear those words from him. Marcus spread his fingers on the arms of the rosewood chair and forced himself to appear at ease. The reverend’s study was a fine enough room, but smaller than Marcus was used to. Whether it was the room, or the awkward nature of his mission, he felt hemmed in. Trapped. He turned his neck slightly within the starched collar of his shirt, seeking relief from the constriction. He couldn’t bear to discuss his mother’s fragile condition, even with her parson. More particularly, he couldn’t bear any delay. But the Earl of Spenford always behaved in a manner befitting his position. “Indeed.” Reverend Somerton’s smile managed to convey both understanding and a shared grief. A churchman’s trick, Marcus supposed, but a good one. He wondered if the reverend had positioned the leather-topped oak desk precisely so the fall of April afternoon sunlight through the study window should bathe him in its glow, making him look as reverent as his title suggested. Sitting in relative dimness, Marcus recalled assorted sins of which he probably ought to repent. He quelled the instinct to squirm in his seat. He was here for his mother’s sake, and the reverend’s affection for his patroness, the Dowager Countess of Spenford, was both genuine and reciprocated. Which was why Marcus expected full cooperation. A series of framed, embroideries hung on the wall behind the rector. Colorful words: Bible verses, Marcus guessed, though they were too distant to read. The kind of needlecraft with which genteel country ladies occupied their time. There were five of these works of art, each presumably the handiwork of one of the reverend’s five daughters. One of them Marcus’s future bride. Marcus bristled, unaccustomed to having his actions questioned by men far more important than the rector of a quiet parish in Hampshire. But this particular parson was not only the man whose sermons he’d sat through as a child, he would soon be Marcus’s father-in-law. He didn’t mean inevitable to sound quite so distasteful. “I have had ample opportunity to—” take my pick “—engage the interest of a young lady in London, but this has not occurred.” Or rather, though Marcus might have engaged their interest, they had not engaged his. Reverend Somerton and his wife would prove more pleasant relatives than some of the grasping parents he’d encountered in the city, he mused. The rector was of excellent birth, even if he’d forsaken his noble connections to “serve the Lord,” as Marcus’s mama put it. Two of the Somerton daughters were beauties—in the absence of fortune or title, the world would expect Marcus to settle for nothing less. His father would have insisted upon a bride worthy of the Earl of Spenford. Marcus insisted upon it, too. “I am still at a loss to understand why you alighted on the idea of one of my daughters.” The rector’s manner remained pleasant as ever, but his persistence was beginning to grate on Marcus’s taut nerves. No need to mention the bargain he’d struck with God on the subject. He wasn’t sure how reverends felt about mere mortals bargaining with the Deity. Marcus Brookstone, Earl of Spenford, would bargain with whomever he chose. Mortifyingly, his voice cracked. Somerton made a hum of concern. With the ease of long practice, Marcus set sentiment aside and pursued that slight advantage. “The marriage would take place as soon as a special license can be obtained,” he said, his words thankfully steady. Today was Monday, he could have the license by Thursday evening and return here Friday morning. In normal circumstances, Marcus would avoid the unsavory implications of such a hasty wedding, but his mother’s failing health ensured no gossip would attach to his actions. At last, some indication the man would consent! Marcus had expected this condition, had reconciled himself to it on the journey down. Somerton pressed his thumb to the distinctive cleft in his chin. Marcus frowned. That would have to cease. The Earl of Spenford couldn’t have a sister in any form of employment. He’d left London struggling to remember any of the Somerton girls’ names—five was a ludicrous number of daughters for any family—despite having encountered them many times previously. Not only in church, where they filled the front left-hand pew in the company of their mother, but also at dinners and receptions held at the homes of nearby gentry. Including Palfont, the estate bequeathed to Marcus’s mother, which would return to her family coffers upon her death. She will not die. I have agreed it with God. He’d had nightmarish visions of taking tea with all five Somerton sisters, inspecting them as if they were horseflesh before making his choice. Thankfully, circumstance had spared him that. “Miss Constance Somerton…” he suggested. “Constance,” the rector said, delighted. “Why, that is excellent news.” All of a sudden he seemed more kindly disposed toward Marcus’s request. Marcus could guess why. He’d encountered Miss Constance Somerton a short while ago in the village, when he’d climbed down from his curricle at the Goose & Gander, not wishing to be forced to prevail upon the rector for refreshment. Having eaten, and about to leave the inn, he’d heard a female cry out. In the stable yard, he’d found the prettiest girl he’d ever seen, trying to sidestep around a young man of clearly amorous intentions. “May I be of assistance, miss?” he’d inquired of the girl. Farnham, the squire’s son, Marcus recalled, stammered an apology to the girl before scuttling away like a beetle. Marcus took a step after him. “Indeed, my lord?” She’d recovered her composure and spoke with a demureness belied by the dimple dancing in her left cheek. “But that will take at least an hour,” he protested. Which perhaps explained her slender figure. In which case, how could Marcus complain? Her beauty and lively nature were more than he’d dared expect. She would command the admiration of Society…he just hoped she was of marriageable age. “My lord…” She hesitated as she curtsied. Her eyes widened in an unspoken plea. He guessed what she wished to ask, and appreciated her delicacy in not framing the question outright. Yes, with a little guidance, Miss Constance Somerton could be the ideal bride. “No benefit will be served by my mentioning to your father that I met you here,” he assured her. “Thank you,” she breathed. Her hand touched his arm ever so briefly. Now, Marcus returned Reverend Somerton’s smile with understanding. Constance Somerton’s liveliness was doubtless a source of concern to her parents—he suspected the average parson’s daughter was far more docile. Not to mention her appeal to the local young men. Her parents would be delighted to have her safely off their hands. “I believe I don’t speak out of turn when I assure you Constance holds you in the highest esteem,” Somerton said. He would have put her at seventeen, better than sixteen, which would have been impossible, but still arguably too young. Though in a year or two the maturity gap between them would narrow…. Twenty? Marcus was surprised, but pleased. Though no one would dare accuse him to his face of robbing the nursery, he hated to be the subject of gossip. His father had spent years schooling him to be worthy of his title—he would not let it fall into disrepute again. Not so naïve after all. He knew Marcus wouldn’t risk that. The settlement wouldn’t be fair; it would be more than fair. “Of course,” Marcus said stiffly. He gathered his riding gloves and stood. Just when Marcus thought the awkwardness past! It was the comment of a hopelessly doting father. The kind of father Marcus had never had. He found himself touched by the rector’s paternal loyalty. “Sir, you know enough of my family’s history to understand that a—an infatuation is the last reason I would marry,” he said. “But it is my hope a strong and natural affection will develop in my marriage.” He would not use the word love, as the parson had. Love was what a chambermaid might feel for a groom. Love had almost destroyed the Spenford earldom in the past; it would not be given the chance to do so again. Affection seemed a proper objective for his marriage. Perhaps not a conventional prayer of the kind a reverend might favor…but Marcus had spoken to God, had he not? “Thank you, it does indeed comfort me.” The reverend moved to open the study door. This awkward encounter was finished. Living in a house filled with women must have addled Somerton’s brain. 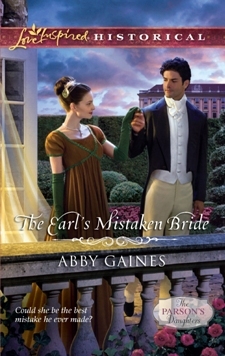 The parson’s daughter—any parson’s daughter—would be honored to marry the Earl of Spenford. Marcus didn’t waste time pointing that out. He’d come here for a wife; he’d found one. Nothing else mattered. The curricle pulled out of the rectory gate right in front of Constance Somerton, so close that one more step would take her smack into the side of a very large gray horse. She gave a little yelp of surprise, and the driver, who’d been looking to his left for traffic, somehow heard her over the clatter of hooves and the rattle of bridles. He immediately reined in the horses, coming to a stop. Lord Spenford! It had been an age since she’d seen him. Why was he here? She wanted to call out an assurance that no apology was needed, though in fact it was: he should have been looking. But as usual, the sight of him reduced her vocabulary to a few nonsense words and made her feel as if it had been days since her last meal. She steadied herself by reaching a hand to the brick wall that ran along the front of the rectory grounds. His voice was exactly as Constance remembered—deep, beautifully modulated. It sent a delightful shiver through her. It sounded as if she was thanking him for almost running her over. He gave her a surprised look, then his face closed over. “Indeed,” he said briefly. “If you truly are unhurt, Miss Somerton, I will resume my journey.” He sprang back up onto the curricle. About to drive off, he checked the horses. “We will meet again soon,” he said, and smiled. Then he was gone, and all that was left to show he’d been there was a cloud of dust and what Constance knew must be a sappy expression on her face at the memory of that smile. It was the answer to a prayer she’d never dared utter. A dream come true, an absurd fantasy…now, about to become reality? “He can’t have meant me,” she said faintly. Hoping against hope that he had. “I saw him outside, he didn’t say a word.” He almost killed me! Although, he had said, We’ll meet again soon. How could she have guessed he meant in church, at our wedding? It went without saying he hadn’t been enchanted by her physical charms: she had none. “His lordship’s desire to marry now is largely to please his mother,” Adrian inserted. Constance nodded. She did not find that odd, quite the opposite. Marcus Brookstone, Earl of Spenford, might be rumored to enjoy every pleasure of the ton, but he loved his mama dearly, always had, and Constance admired him for that. “None of us is perfect,” Constance pointed out. “Constance, you don’t find him a little proud?” her mother asked. “Margaret!” The reverend shifted on his chair, which wobbled, causing him to mutter ominously. Marcus had been born the second son of the previous Earl of Spenford. Stephen, his older brother by six years, had been by all accounts the perfect heir. Until he died in a hunting accident when Marcus was fifteen. “I don’t find Lord Spenford at all proud.” The event that had informed Constance’s opinion would seem trivial to her parents. But three years ago she’d realized Marcus Brookstone was a man worthy of her deepest feelings. Constance didn’t know how, even with their faith, her parents could remain so calm. Her father’s insistence on taking the Word out to the laborers in the fields, or wherever they might be, had landed him in trouble with his Bishop. He’d been accused of Methodism, of creating a schism in the parish. It was monstrously unfair, when her father held unity and inclusiveness within the church as one of his dearest tenets. There was a risk the Bishop might remove him from the parish; her parents would lose their home and livelihood. Constance’s youngest sister Charity vowed frequently to live with Mama and Papa the rest of her days. But in truth, Constance had expected to be the spinster of the family. With four sisters prettier than she, she was used to going unnoticed by all, with the exception of her parents. And perhaps of older people, like the dowager countess, who seemed to find her plainness soothing. Though the local young men were scrupulously polite in greeting her, in asking her to dance after they had danced with her sisters, no marriageable man had ever, as far as she was aware, seen her. Looked past her sisters, past all other young ladies, and chosen her. “How blessed he is, my sweet,” her husband corrected her. Though in many ways the most tolerant of men, he didn’t allow luck to be given credit for divine Providence. Five minutes past eleven o’clock on Constance’s wedding day and no sign of a bridegroom for the ceremony that should have started on the hour. Standing in the churchyard, trying to appear nonchalant while her body vacillated between chills and extreme heat, Constance was conscious of all eyes upon her. Most discomfiting. She could almost feel sorry for Isabel and Amanda, the two of her sisters acclaimed as beauties. To be stared at so intently… Constance shivered in the spring sunshine. “Cold, my love?” Isabel asked. Instilled with the supreme confidence that came with beauty, she wouldn’t understand Constance’s petrified state. “Veils are all the rage in London and Paris,” Amanda said, oddly defensive. Constance patted her arm. “I trust your knowledge of the fashions, dearest, for you know I have none.” She considered taking back the reticule and small posy of flowers Amanda was holding for her, but there was too much chance her nervous fingers would shred them. “It looks very becoming on you,” Amanda said. She’d used the same French lace for the veil as Constance’s mother had for the elegant trim she’d added to Constance’s best blue muslin dress. Without compunction, Margaret Somerton had cut into a beautiful tablecloth that had been a gift from her own mother. The trim made a fine feature on an otherwise simple dress, drawing attention away from Constance’s face, and down to her figure. The veil, anchored to her bonnet with a cream-colored satin ribbon and reaching to her chin, achieved the same end. Constance dared not ask where Amanda had obtained the ribbon. Her sister managed to fancy all her clothes with furbelows that Constance suspected were gifts from young men. “You realize, Amanda, as Countess of Spenford I will be in a position to offer you a London season,” Constance said. “Perhaps next year…” So long as they weren’t in mourning for the dowager, of course. Amanda had yearned for a London season for as long as she’d known such a thing existed. Amanda merely squeezed Constance’s hand. Maybe she still had the headache she’d complained of earlier when she’d begged to be excused from the ceremony. Constance had in turn begged her to attend. It was bad enough to be getting married lacking one sister’s presence—there hadn’t been time to send word to Serena in Leicestershire and have her travel home to Piper’s Mead. Now, that seemed a good thing. Serena might have had a wasted trip. The villagers were growing restless, despite the valiant attempts of Reverend Somerton and his wife to engage them in conversation. While most of the men were working, a good number of the women thronged the churchyard, eager to witness the most prestigious wedding in the village for at least a generation. A couple of lads had taken advantage of the festive atmosphere to station themselves on the churchyard wall, normally forbidden territory. They nudged and jostled each other, enjoying the risk of an imminent fall. Even as she spoke, she glanced at Isabel, confusion written on her broad face. She was doubtless wondering why any earl would choose Constance over Isabel, whose fair beauty had been a source of village pride since she’d been in the cradle. “You look lovely, Constance.” The assurance came from Charity, who, although just turned fifteen, displayed an unusual sensibility for other people’s feelings. Constance smiled her thanks, though her sister probably couldn’t see through the veil. Constance had never wished for beauty…at least, not since she’d accepted, years ago, that she would always be the most ordinary of the Somerton girls. Not that her face sent small children screaming for their mothers, or anything like that. She’d spent enough hours in her youth searching the mirror for signs of beauty to know her brown eyes were warm, her eyebrows nicely shaped. Those features assured she was acceptable. And she’d inherited her mother’s excellent figure, for which she was truly grateful. It was just…on this day, when she was about to marry one of the most handsome men in all England, she would have given much to be pretty. “Perhaps,” Constance said doubtfully. She hoped the Lord hadn’t revealed her besottedness to Lord Spenford—the poor man would be mortified to know his bride cherished such romantic notions for a near stranger. She could only hope it was indeed her gentle spirit, whether revealed through divine guidance or through the dowager, that had caused the earl to settle on her. His mother boxed his ears for referring to Lord Spenford as “he” rather than “his lordship” and for daring to express an opinion on the earl’s conveyance. The women set to straightening their dresses, adjusting their bonnets in a panicked flurry that reminded Constance of the Bible parable about the foolish virgins readying themselves for the bridegroom. Constance stayed still. No minimal adjustment would elevate her to sudden beauty. A stir of interest ran through the crowd, dividing attention between her and the churchyard gates. “Oh, gracious.” Margaret Somerton was visibly torn. It wasn’t like Amanda to show such care for others; Constance blinked away unexpected tears. “It’s what I wish more than anything,” she confirmed. Hoping it was true. Almost before she finished speaking, Amanda was hurrying into the church. And Constance’s attention was drawn to the fine curricle pulling up behind the dowager’s coach, sent earlier from Palfont to convey the Somerton women to the church. Constance didn’t recognize the gentleman driving the curricle, nor did she notice the groom on the back. She had eyes only for her betrothed, sat alongside the driver. Poor Lord Spenford would be exhausted, having traveled so far the past few days. Marcus, I must learn to call him Marcus. But the moment the curricle stopped, he jumped down with an energy that made a mockery of her concern. His dark hair lifted in the breeze as he strode toward her father. The crowd melted back in a flurry of curtsies and, from the boys, removal of caps. An impeccable reason for tardiness. Constance wouldn’t wish to marry a man who failed to render assistance. Her father inquired of the injured passengers, declared his intent to pray for them. “May I introduce you to the Marquis of Severn, who will stand with me as groomsman,” Marcus said. His friend, the same impressive height as the earl, but to Constance’s eye not as handsome, exchanged bows with the reverend. Reverend Somerton introduced his wife to the Marquis…goodness, would the formalities never end? Then, suddenly, they were finished, and her father was beckoning to Constance. Isabel gave her the slightest of shoves; Constance made her way on trembling legs. She dropped a tiny curtsey, afraid if she sank too low she would never rise again. To nurse a girlish dream was one thing; to live the reality quite another. I can’t go through with this. The earl took her hands in his, an intimacy she hadn’t expected. His fingertips curled beneath hers, warm through the fabric of her best gloves, anchoring her. Her gaze darted over his shoulder to the worn stone building she loved as well as her own home. She would enter the church a parson’s daughter; she would leave it a countess. A wife. His wife. The earl’s grip tightened. Her doubts lifted like mist warmed by the sun, to drift away on the breeze. He brought her left hand to his lips, and through her glove pressed a kiss to her knuckles. Warmth flooded her, traveled directly to her legs where it had a bizarre weakening effect. Constance locked her knees, put all her energy into holding her ground. Constance calmed her nerves by focusing on the string of names. And reflected she would be more pleased if he were mere Marcus Brookstone. He spoke clearly, rather than loudly, but the words rang to the rafters above the heads of the enthralled congregation. “To have and to hold…to love and to cherish,” the earl repeated firmly. She made the same vow, her voice shaking, adding the bride’s promise to obey. Behind her, she heard a small sob. Mama. Pragmatic Margaret Somerton had surprised her daughters, and herself, with several bouts of sniffling over the past few days. Her mood had been unimproved by her husband’s assurance she was not losing a daughter, but gaining a son. Constance slid a sidelong glance at her mother’s new “son.” At several inches taller than she, at least six feet, his height was potentially intimidating. “Do you have the ring?” her father asked. The earl—Marcus—turned to his groomsman. Constance had forgotten his name…Severn, that was it, the Marquis of Severn. Severn handed over a circlet of gold. After a moment’s pause, Constance realized everyone was waiting for her. She fumbled to free her left hand—the one he kissed—from her glove. Marcus took her bare fingers, and for the first time they were flesh to flesh. About to be made one. “With this ring, I thee wed,” he repeated after her father. Another few moments, and the gold band slid down her finger. Making her his. Constance’s mind shied away from the thought. “Those whom God hath joined together, let no man put asunder,” her father intoned. The worry evaporated in the warmth of the gaze Lord Spenford—her husband!—turned on her. A half-smile on his lips, he reached for her veil, lifted it. Marcus’s mouth straightened into a line that could only be described as grim. “My—my lord?” Words died away as Constance absorbed his expression.